OA Region One : Pacific Northwest of North America, Canadian Provinces of Alberta, British Columbia, Northwest Territories, Saskatchewan, and Yukon, and the States of Alaska, Idaho, Montana, Oregon, Washington, and Wyoming. OA Region Two : Mexico, Hawaii, Northern Nevada, and California. OA Region Three : South America, states of Arizona, Colorado, New Mexico, Nevada, Oklahoma, Texas and Utah. 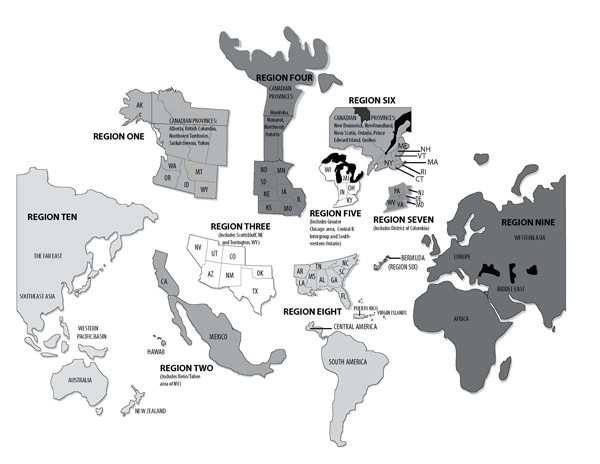 OA Region Four : America Illinois [except the Chicagoland area], Iowa, Kansas, Missouri, Minnesota, Nebraska, North Dakota, South Dakota, Manitoba, Northwest Ontario, and Nunavut Territory, Canada. OA Region Five : America, Indiana, Northern Illinois, Kentucky, Michigan, Ohio, Southwestern Ontario Canada, Wisconsin. OA Region Six : New York, Connecticut, Massachusetts, Rhode Island, New Hampshire, Maine, Vermont, Central and Eastern Ontario, Quebec, Newfoundland and Labrador, New Brunswick, Nova Scotia, Prince Edward Island, and Bermuda. OA Region Seven : America Delaware, Maryland, New Jersey, Pennsylvania, Virginia, Washington, DC and West Virginia. OA Region Eight : USA’s southeast states: Alabama, Arkansas, Florida, Georgia, Louisiana, Mississippi, North Carolina, South Carolina, and Tennessee. It also includes Puerto Rico, South America, Central America, and all of the Caribbean Islands. OA Region Ten : Australia, New Zealand, Far East, South East Asia and the Pacific. OA Virtual Region : For online meetings, phone meetings and other non-real time meetings and service boards.